Years ago I tried a new recipe on a whim for Thanksgiving. 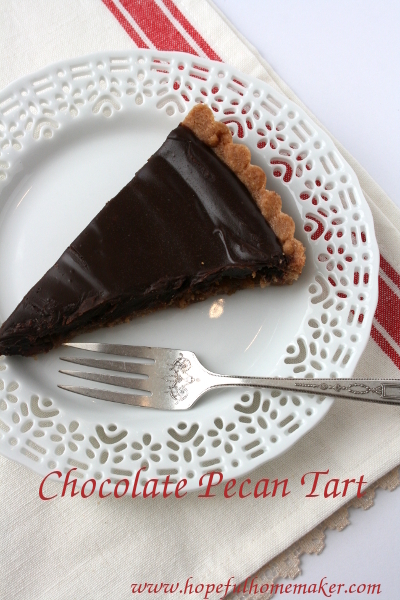 It has been requested every year since then, and this Chocolate Pecan Tart has become as much a part of our holiday traditions as pumpkin or apple pie. Rich in flavor, it is an elegant addition to any holiday dessert as well as being an excellent combination of pecan and chocolate pies. 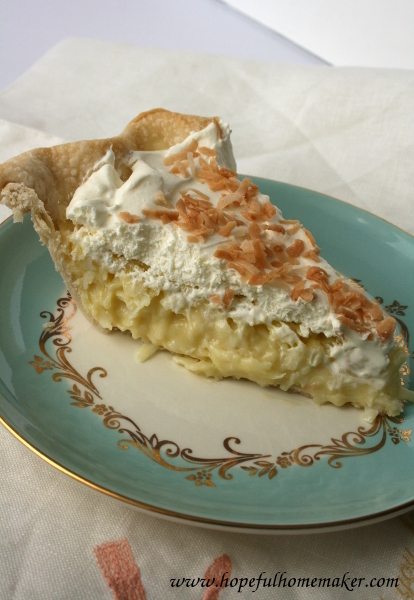 It’s also a dessert offering that appeals to those who don’t care for pie crust or traditional pies. 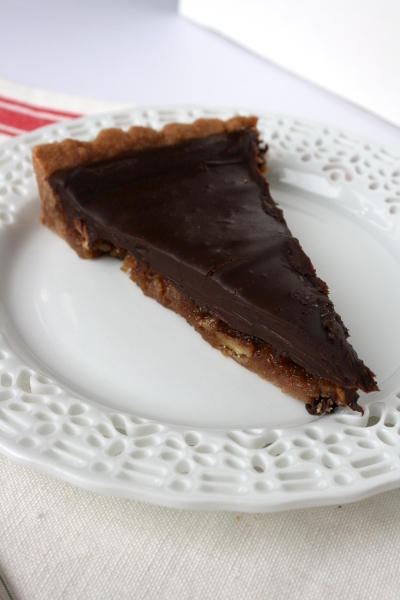 The tart has a chocolate crust, a thin layer of pecan pie filling and a top layer of chocolate ganache. In a food processor, cream the butter. Beat in flour, sugar and salt. Place chocolate chips in small bowl. Heat cream and pour over chocolate; whisk to melt chocolate. Add chocolate cream to dough and beat to combine. Turn out onto lightly floured surface, then shape into a disk and refrigerate dough for 30 minutes. Pat dough over the bottom and up sides of a 10-11 inch tart mold with a removable bottom such as this one. Set aside. Preheat oven to 325. In a medium mixing bowl, whisk together corn syrup, eggs, butter, sugar vanilla and salt. When combined, add pecan pieces and stir to coat. Gently pour over uncooked tart shell. 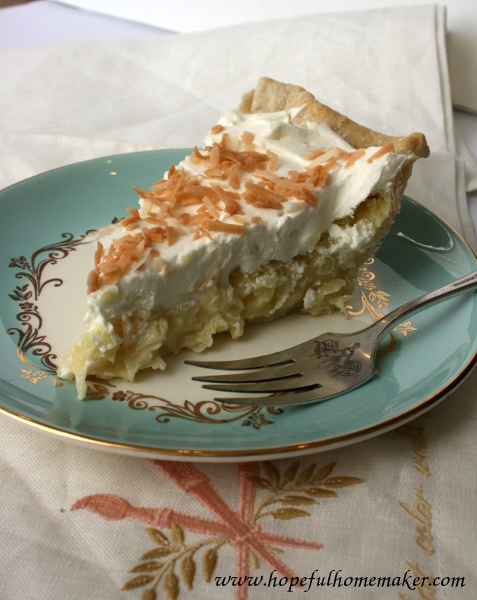 Bake until a knife inserted into the pie filling comes out clean, about 25-35 minutes. Remove from oven and cool completely. In a small saucepan, heat cream to a simmer. Place chocolate chips in small bowl. Pour cream over chocolate and whisk to combine. Pour ganache over cooled pie and let set. Refrigerate until ready to serve. 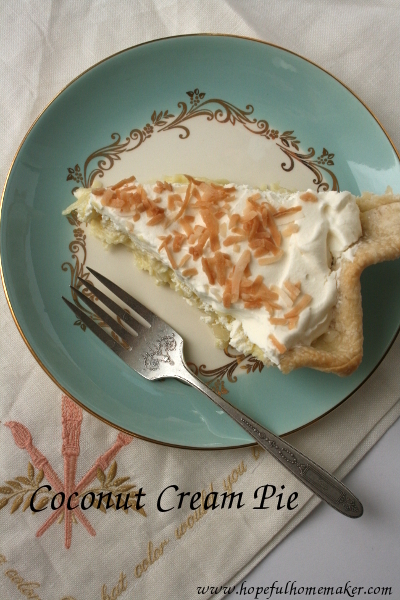 Click here to see my list of tools I love and always use when making pies. I hope you enjoy this tart as much as we do! Happy baking! The healthy ones have left for school and work and the sick ones are still in bed. My youngest woke up crying before they left, so I turned off the lights and sat down to hold her in the semi-darkness. Snuggled against my chest, her breathing slows and deepens and soon she is asleep. 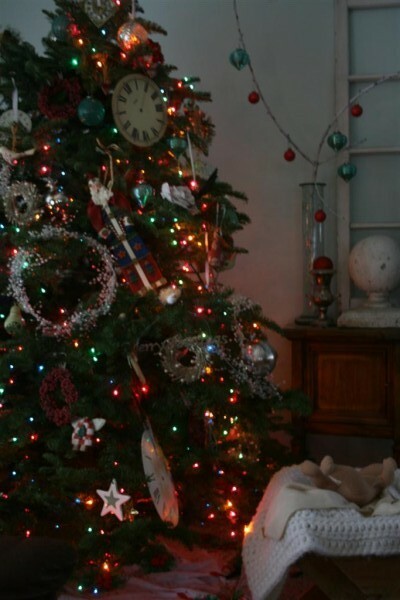 I sit like this, staring at the Christmas tree, my eyes tracing a now-familiar path from ornament to ornament as I study the glow of the lights on their different surfaces. For a moment I feel like I’ve gone back 25 years to my parents’ living room where I would usually sit by myself for a few minutes in this same semi-darkness to stare at the tree before bed. I had a jolt of worry hit me recently as I was reviewing our holiday season so far. 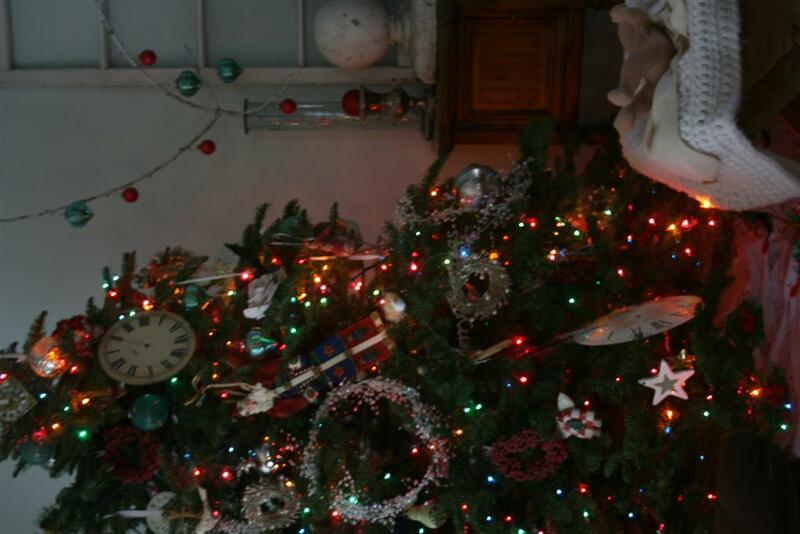 I felt good about the feeling we’ve cultivated in our home this month, confident that my children had all spent some time in the Christmas spirit. But suddenly I felt worried that we weren’t connecting with Christ directly enough. I want them to know, absolutely KNOW, that this is all about Him. That He has graven us on the palms of his hands, that He will never forget us or forsake us, and so we need never fear, or forget or forsake Him. Last night for Family Home Evening we started out reading a couple of touching Christmas stories and ended up talking about the shepherds. We read Luke 2:1-20 together and I love the way all of us have it partially memorized. As a family, we decided there are five lessons we can learn from the shepherds in these verses. 1. The shepherds were “abiding in the field, keeping watch over their flock by night.” They were doing their duty, and while doing it, came the grand experience. Sometimes we think great things happen to people doing more glamorous things than we are. But these were lowly shepherds, so lowly that in their society they couldn’t even testify in court. I’ve written before about the importance of doing what needs to be done regardless of how we may feel about it in the moment. Of course, we don’t know how each of the shepherds may have felt on that holy night. One might have been tired, one might have been grumbling, one might have been worried about something at home. The point is they were there, and for each one of them, showing up to do their duty was what offered admittance to the most amazing experience of their lives. We can be like the shepherds, making sure to show up, abiding by our responsibilities even in the long hours of the night, and in doing so, we can trust God to give us the experiences we will need to grow in love for and knowledge of Him. 2. An angel appeared to the shepherds, declaring “good tidings of great joy, which shall be to all people.” The multitude of angels sang “Glory to God in the highest, and on earth peace, good will toward men.” How can this apply to us? There is no heavenly chorus out on our lawn, but we have something just as precious. We have the scriptures. We have the testimonies of prophets who have declared the divinity of the Lord Jesus Christ with eloquence and power. We have the testimony of Jesus Christ himself promising us abundant life, eternal life, joy. With all these testimonies to draw from, we don’t need angels singing in the sky. We will have angels singing in our hearts if we will just do our part by opening our minds and hearts to the words of those who testify. Are we doing that? Are we bringing a spirit of reverence, a spirit of listening, of learning to the formal, scheduled opportunities in our lives such as Church, scripture study and family prayer? Are we feeling the song of the angels within us? 3. When the angels left, the shepherds acted. They said to each other, “let us now go even unto Bethlehem, and see this thing which is come to pass.” They didn’t say, “let’s go tomorrow” or “we should go sometime.” Verse 16 states “and they came with haste.” What are we doing with haste? Are we acting on the promptings of the Spirit? Are we responding in haste when we know we should do something good? 4. The shepherds didn’t keep their experience to themselves. Even with their low social status, they testified, making known abroad what had happened. “And all they that heard it wondered at those things which were told them by the shepherds.” Are we living our lives in a way that makes people wonder at us? Do they wonder what makes us so happy? What gives us the strength to be different? Can we work harder at being a light, even among groups of people who are all supposedly committed to being a light? What makes us feel too small or insignificant to testify, and how can we overcome it? 5. I love verse 20. “And the shepherds returned, glorifying and praising God for all the things that they had heard and seen, as it was told unto them.” They went right back to work, back to the fields, back to the sheep. They didn’t expect a new, easier life because of their experience. But they did take back to that same life a new appreciation for the goodness of God. Their hearts “glorified and praised” God for the experiences they’d had. When we return to our work from an uplifting experience, do we continue to glorify and praise the Lord for what he’s done? And as these special experiences fade into the past, can we work harder to “enlarge our memories” by thinking back far enough to remember these sacred times and still give praise, glory and gratitude to the Lord? How long can we nourish that kind of flame to warm ourselves and others by? Of course, when I type it here, it’s without the interruptions and the distractions so it sounds like we had some incredible discussion. It wasn’t. But we tried, and I hope seeds of ideas and desires were planted and nourished by our talk. So we ended last night with a challenge to find elements of the shepherds’ experiences in our own lives. We can engage in our duty and watch for faith-building experiences to come our way. We can open our hearts to the numberless witnesses, letting angels sing in our hearts. We can respond with haste to the call to act on our knowledge. We can share what we know with others, and do it in a kind, happy, loving way which will make people wonder at what we have shared. And we can return to our daily grind better people, people with hearts full of gratitude and praise to the Lord for the simple gift of living it. I want to be a shepherd. I hope my children do too.